Does Reputation Management Really Matter? Reputation management is an important part of the online efforts for healthcare practices, especially in today’s world where patients have more access to information than ever before. Reputation management involves the solicitation of ratings and reviews from patients after they visit your office, while consistently monitoring your online rating and reviews on websites such as Healthgrades. Many practices today are also monitoring what’s being said about them on social media, since they know social media is the new word of mouth. Although only about 10% of patients naturally post a rating or review about you or your practice online, unsatisfied patients are more motivated to complain, leaving providers who are not proactively soliciting and monitoring with an online presence that doesn’t reflect reality. Reputation management is more than simply asking patients for reviews, monitoring ratings and responding to negative reviews. Reputation management can make patient feedback the heartbeat of your practice and a way to ensure you’re providing a high quality patient experience. Glad you asked. In the internet era, your online reputation is your reputation. It use to be that you practiced great medicine and patients came through the office doors. Today, patients have more choice and more tools than ever. Regardless of whether a patient was referred by another provider or a family member, chances are they’re going to check-up on you online. And if they’re given a few different names, what they see about you can greatly influence their decisions. It’s your job to ensure that the offline realities of your practice match the online reality these potential patients see. If you’re a great doctor, but a few angry patients post negative reviews and tarnish your online reputation, we can guarantee it will affect your practice. In 2015, ninety-two percent of consumers read online reviews to determine if a business or medical practice is a good business. That number has been gradually growing over the past several years–76% in 2012, 85% in 2013, and 88% in 2014. Forty percent of those consumers make a judgment call after reading only a few reviews. If the top two to three reviews are negative, they will be less likely to use the practice in question. Imagine a patient has been given a few names of providers in the area. The patient goes and Googles, “Dr. Smith orthopedic surgeon.” The patient is going to see at least four or five different rating or review site profiles for Dr. Smith. If the star ratings are low across the board or say the last two patient reviews were negative on profile the checked, patient is likely to have an unfavorable opinion of the provider or practice. Now, if that same patient then goes to Google with one of the other names she has, “Dr. Jane Doe orthopedic surgeon”, and she sees favorable reviews across all of her profiles and there are plenty of them, the patient is likely to have a favorable opinion of the provider or practice. Who do you think she is going to call or make an appointment with online? Additionally, search engines such as Google give favorable weighting in their search engine results for practices with a large volume of reviews. Up to about 50 total reviews, Google will increase the positioning of your listing in their search results for searches related to what your practice offers. The more reviews your practice has on its Google My Business profile, the more likely you’ll be to appear on the first pages of a potential patient’s search related to your practice. Remember, it’s in Google’s best interest to show the best providers to patients and Google still drives the largest percentage of new patients to a practice. While ranking the “best provider” may be subjective and your opinion of online ratings and review websites low, there’s high return on investment to reputation management. Plus, they’re not going away. 85% of doctors say that they proactively check online reviews about themselves. WANT TO PROTECT YOUR ONLINE REPUTATION? As a healthcare provider, there are several sites you should be aware of when it comes to your professional online reputation. Healthgrades is a website that allows patients to search for medical providers or hospitals to receive care. It’s also the largest and most widely used doctor review website. In 2013, Healthgrades was the first stop for 43% of patients searching for providers. Healthcare providers can create free profiles that patients can search and review. After seeing a provider, patients can rate them based on their care and can also leave reviews. When a patient searches for a provider, the provider with the best reviews and ratings are often listed at the top of the search. Since it’s the number one site with patients, Healthgrades can’t be ignored. Vitals is the second most popular healthcare provider review website. Almost a fifth of patients who use Vitals, do so to search for specific medical providers reviews. A major difference between Vitals and other popular websites is that Vitals also allows patients to compare the cost of a provider or procedure to other options. This is a very valuable option since high deductible health plans are becoming the norm therefore, being able to compare costs is becoming more important in provider selection by patients. Vitals calls itself “the most robust and accurate provider database” and claims that it has 90 million members. With such a large number of users, your Vitals profile is important to monitor. CareDash is an online review site built to provide patients with a completely transparent and safe platform to voice their opinions and make better decisions about their healthcare. This platform makes it clear that they do not accept any form of compensation to remove negative reviews from doctor profiles. For patients who want to make sure that the information they’re looking at is truthful, CareDash is one website to surely take a look at. Interestingly enough, CareDash also provides information about how much money a provider has received from other companies. This will show you whether or not a doctor has been paid by certain medical companies to favor a certain medication, for example. RealSelf is a niched online review platform that has specialized in connecting patients to doctors who treat cosmetic concerns. This means that the doctors on this site could be dermatologists, plastic surgeons, and orthodontists. For patients who are looking for a new provider to help with their cosmetic and aesthetic concerns, finding a reputable doctor is key. That’s why RealSelf aims to provide patients with extensive information on each provider in addition to showcasing the reviews left by other patients. RealSelf gives prospective patients information on the doctor’s consultation fee, how long it usually takes to get an appointment, and what treatments are offered by that particular doctor. ZocDoc is another online review platform designed to connect patients with providers and hospital systems around the United States. This site differentiates itself from the rest by allowing patients to book an appointment with a provider directly from their website. Many practitioners set up their profiles to make this process easier for patients, eliminating the need for them to call in and schedule during regular business hours. In addition to showcasing online reviews left by patients, ZocDoc offers patients information on a doctor’s board certifications, hospital affiliations, and “ZocDoc Awards’ that are granted after certain milestones are met through patient reviews. MD.com is another doctor review website that showcases providers across the United States. They goal is to give patients the best information possible to make the right decision. With information about the doctor’s education, services, and affiliations, MD.com takes a step beyond online reviews. By letting patients schedule telemedicine appointments, MD.com helps patients connect with a doctor regardless of location or ability to travel. For patients with chronic illness, this service can mean the difference between getting an appointment or going untreated. Similarly, MD.com allows patients to book an in-office appointment directly through their website. Since they have over 880,000 profiles on MD.com, prospective patients can surely find their a new provider using this platform. WebMD offers prospective patients an entire physician directory to make the best medical decisions possible. While WebMD may mostly be known for giving patients information on diseases, symptoms, or conditions, they have also branched into the business of connecting doctors and patients. Their physician review profiles are often less robust than those found on other doctor review platforms. WebMD allows patients to leave reviews, but people browsing doctor profiles will only see aggregate star ratings without comments. 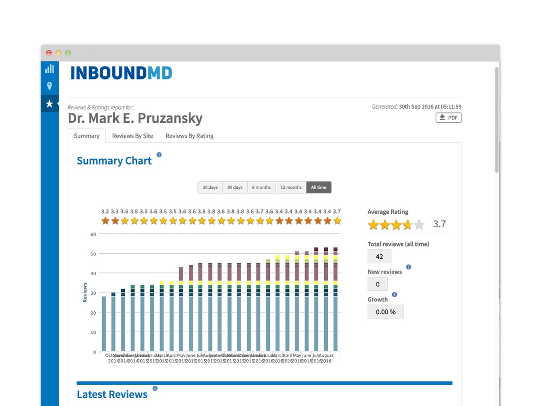 Instead, WebMD has broken down doctor reviews into an overall score and individual ratings on aspects like wait time. RateMDs is another healthcare provider review website, similar to Healthgrades and Vitals. On RateMDs, patients can rate a doctor for knowledge, punctuality, staff, and helpfulness as well as leave reviews based on their experience. While not as large as Healthgrades and Vitals, about 24% of patients say RateMDS is their most trusted source for physician reviews. This is enough usage to convince any provider that should be paying attention to their profile on RateMDs. Today, when a patient conducts a Google search for your name, Google displays information from your Google My Business profile on the right hand side. Many marketers focus on Google My Business for its SEO value, but patients can see reviews left from patients when they search. These include reviews left on directly on your Google My Business profile and also, aggregated reviews from other website such as Facebook and Healthgrades. 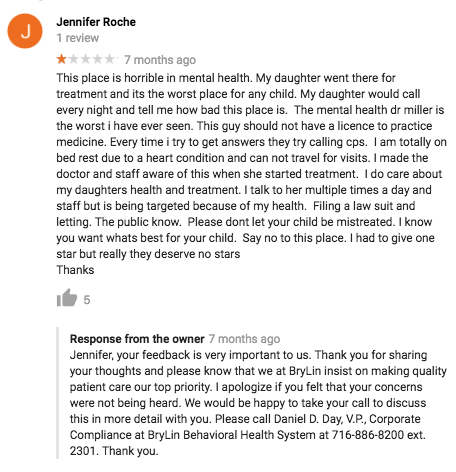 Out of all the medical provider review sites, Google My Business reviews may be the most important to manage as a large majority of patients go to Google first when looking for a provider. 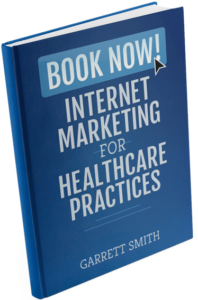 Facebook is similar to Google My Business in that it’s a website any business can use, yet so many patients are using the network it can’t be ignored. It’s important for healthcare providers to carefully manage and monitor their Facebook pages because, like Google, Facebook reviews are highly visible since most patients will have their Facebook profile. Many patients are also starting to send private messages requesting appointments, something that would be missed by a provider not monitoring their profile. Be careful not to use your personal page as your business page on Facebook. Instead, create a business page so patients aren’t seeing your personal posts along with your professional posts. Last, but certainly not least, there’s Yelp. You know Yelp. You hate Yelp. You love Yelp. You want to Yelp about Yelp. Yelp, best known for restaurant and retailer reviews also has a section for healthcare reviews and it’s heavily used by patients. Again, because Yelp is such a large review website, it’s important for healthcare providers to monitor their profiles on the site. Patients leave reviews based on their satisfaction with you as the provider, your staff, and the care they receive. You know, they Yelp. The best way to prevent negative reviews from damaging your online reputation is to solicit reviews from all your patients. This is because the only way to minimize the effect of a negative review is to have lots of positive ones coming in afterwards. Unhappy patients are more likely to leave a review online naturally, but when asked happy patients are more than willing to will leave reviews as well. In fact, a recent survey stated 90% of people asked to leave a review did so. To solicit reviews, there are several different methods you could try. First, ask for a review in-person at your office. This could be the best time to ask for a review because when patients are in your office, the care they just received is at the top of their mind. You could have patients either fill out a review on their mobile phone or you could place tablets in convenient locations, so they can post a review as they leave. Second, you could ask for ratings and reviews via paper forms that patients could fill out in the office or at home (and mail in). This works especially well if your patients are older, don’t want to post feedback online or you could also hand out business cards with a link on them to review the practice, so the patient could leave a review from home later on that day. Sending follow-up emails or text messages after the patient visits your office is another great place to solicit reviews. At the end of the email or text message, include a link for them to post a review about their care. Another option, which we recommend to all practices, is to automate the solicitation of reviews using review software such as RepCheckup. Software solutions can solicit reviews from patients via email or text message after their visit without having to manually ask or transcribe the review. This ensures that you or your staff do not forget to ask and every patient gets an opportunity to participate. Remember, the best way to fight the potential for negative reviews is to constantly be receiving new positive ones. It’s important to keep track of what your patients are saying about you. Combing the internet to find any mention of your name and reviewing multiple profiles can take hours–hours you don’t have. That’s where reputation management software such as RepCheckup from InboundMD comes in handy. Monitoring your online reputation for you, saving you the time and hassle. Monitoring reviews isn’t enough to ensure a prolific online reputation. It’s also important to recognize patients by responding to both positive and negative reviews. Instead of crafting an individual response to each and every review, create a boilerplate response for positive reviews and another for negative reviews. This makes responding easier, more efficient and also allows other staff members to post responses for you. Negative reviews from patients are going to happen. Responding to negative reviews is key in helping improve your practices and earn another chance to have that reviewer come back into your office. Your response will really set the stage for not only that reviewer, but prospective patients who will be reading your response in the future. Keep in mind that people who are looking at your reviews will not have any context. They won’t know that the negative review was left on your profile accidentally. They won’t know that the reviewer left upset because they weren’t prescribed opioids. They won’t know that the patient came back and apologized. Instead, someone reading a negative review will just see what the original review said – and how you responded. We always recommend that doctors respond to every review left for them. But this is never more important than with negative reviews. Make sure your responses are kind, understanding, sympathetic, and include a request to privately discuss the situation with the reviewer. 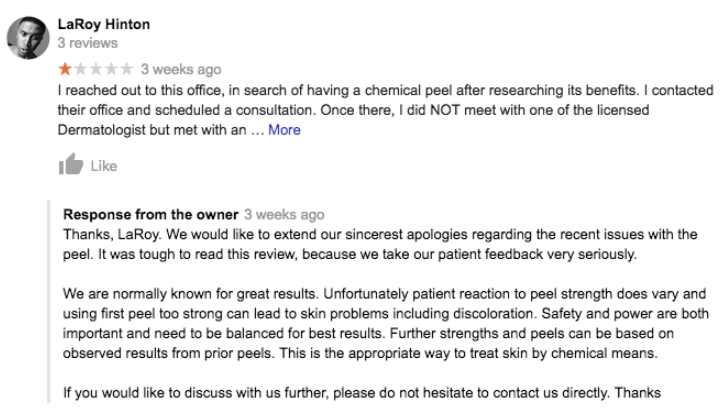 In the review above, the client detailed their experience after going in for a chemical peel at a dermatologist’s office. Instead of the results they were looking for, they experienced an increase in discoloration immediately after their peel. The doctor expertly replied with an apology, explanation that they are known for great services, and an invitation to discuss the matter privately. Now, when someone is reading this negative review in the future, they will be able to see that the doctor cares and responded appropriately to resolve the patient’s complaint. In this negative review, you can clearly tell the reviewer has an emotional investment in the care of their mother – which is absolutely understandable. 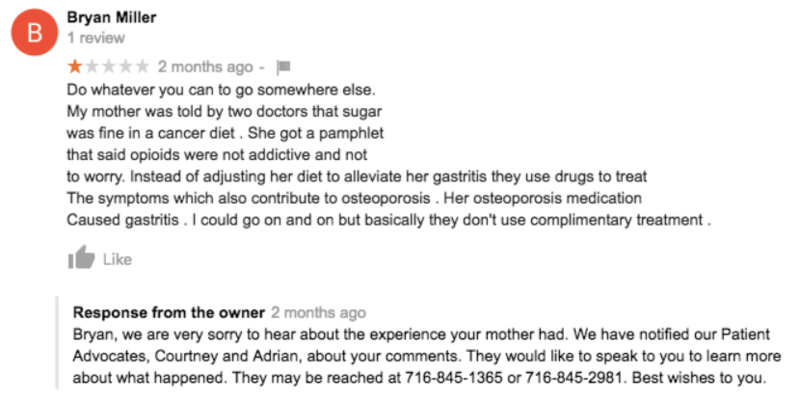 In their review, they complain that their mother was not given complimentary treatments that took all of her health concerns into account. To address this, the owner responded with an apology and request that the reviewer contact their Patient Advocate to get to the bottom of the situation and improve treatment in the future. In this negative review, the reviewer also demonstrates a big investment in the care of a loved one and that they feel the doctor mishandled that responsibility. Their response is personalized, sympathetic, and apologetic without directly admitting to fault – which is especially important when someone is claiming that care was mismanaged. By directing the reviewer to contact them directly to discuss the situation, a future reader can see that this practice cares about what their patients are saying and are actively working to improve care at their location. Reviews are an important part of your online reputation, but they’re also a useful tool to use in your overall practice marketing. Oftentimes, providers tend to leave online reviews on their respective profiles without giving much thought to what those reviews could do for people browsing their website. Though many people do find new providers through a Google search, some will land on your website first or choose to browse your site before even looking at online reviews. This means you have a great opportunity to showcase your online reputation directly on your site. For some, this means creating a rotating carousel on the site’s homepage that contains patient reviews. For others, it means reaching out to positive reviewers to expand their feedback and create a patient success story to display on their site. Online reviews don’t have to just stay on your professional profiles. When you incorporate what’s being said about your practice into your social media, you can experience additional benefits. Find your favorite online reviews left by patients and place them into your social media posts. This could be a text-based post or, better yet, a nice graphic that contains the online review inside of it. There are public graphic design sites, like Canva, available for people who want nice graphics without hiring a graphic designer. Similarly, you can find images are part of the public domain, or the creative commons, to improve any design and create a unique social media graphic to showcase a review within. If you have a physical product that customers can pick up in your store or online, you have the great opportunity to incorporate patient feedback onto your packaging. For dermatologists, this is a common practice to further reinforce the quality of a skincare product. For other types of doctors, you can include patient feedback on pamphlets and business cards to remind people why they should be coming to you for the best care possible. Using real patient feedback to fill space on your packaging accomplishes two things: it reinforces an existing customer’s sense of loyalty and it also helps convince potential patients who may be browsing your products to move ahead with their purchase or to schedule an appointment with you. Here’s something online marketing groups don’t often discuss: physical advertising. Before a potential patient even schedules an appointment, you could entice them by displaying snippets of your online reviews through an attractive sign on your window. Each piece of collateral that you create to display in your store, and online, helps build your brand story in the eyes of the customer. Create signage that can be displayed in your office and even in local papers. If a great review you’ve received is simply too long to place on a poster, pick a shorter quote to showcase. To give your advertisement more authority and credibility, be sure to credit the reviewer and point readers to where they can find this review online. Is your online reputation working for or against you? Patient reviews play an important role in how other potential patients view you and your practice. Creating a good reputation management strategy can make the difference in a positive online reputation or a negative one.